Little hot dogs rolled in bread. 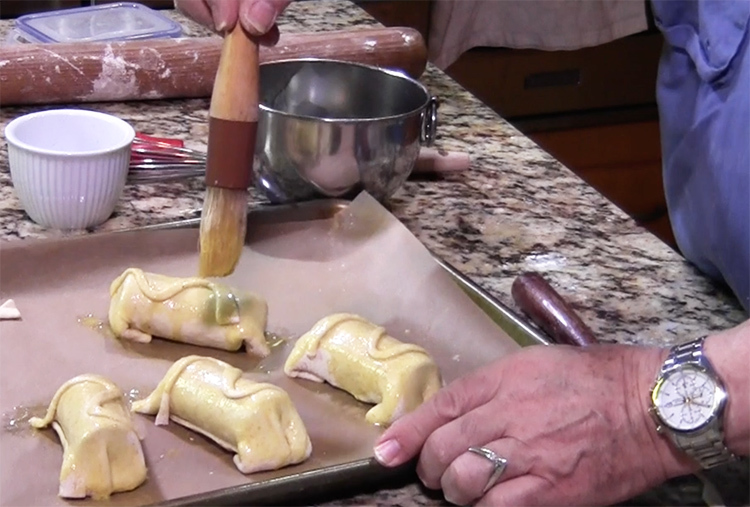 So why would I make a big deal out of pigs in a blanket? I wouldn’t. But what if I were to say we’re going to make Saucisson en croûte? That’s pig of a different color. 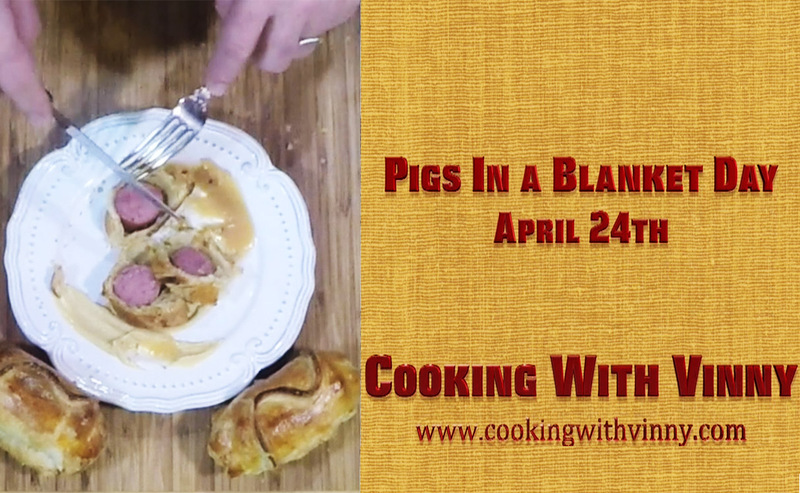 Rolling sausage in bread or bacon or even pancakes is celebrated around the world. Sausage rolled in bacon (and that is some major pig on pig violence going on in your mouth) is a traditional part of Christmas Dinner in the UK. In Germany they have: Würstchen im Schlafrock,” sausage in a dressing gown.” That paints a very descriptive in not beautiful picture. Other countries, other names much harder to say. The Danes have Pølse i svøb, which means, _ _ “sausage in blanket.” And in Finland pigs in blanket are known as nakkipiilo, which according to Wikipedia means “hidden sausage”. I guess is a variation on hide the salami. This recipe serves 4 as an appetizer or first course. This is not finger food. 2 kielbasa sausage. Going to use 1/2 a sausage per person. Start by cutting off the funny round ends of the kielbasa then create 4 equal pieces. I decided to steam the sausage in beer. This made the sausage plumper and moister. Also it’s a way to avoid using sausage straight from the refrigerator. Steam for about 10 minutes then remove to a board to cool. Hot sausage in puff pastry will melt the pastry. Beat the egg with the water and set aside. On a lightly floured surface roll the pastry sheets into 12 by 12-inch squares and then cut again into 4 equal squares. Brush the tops and sides with the egg wash. I like to put some type of design on the top. I couldn’t find my small pastry cutters so I cut small strips of pastry and curled it on top of each roll. Bake until browned and shinny, about 20-25 minutes. Transfer to a rack and cool for about 15 minutes, before serving. 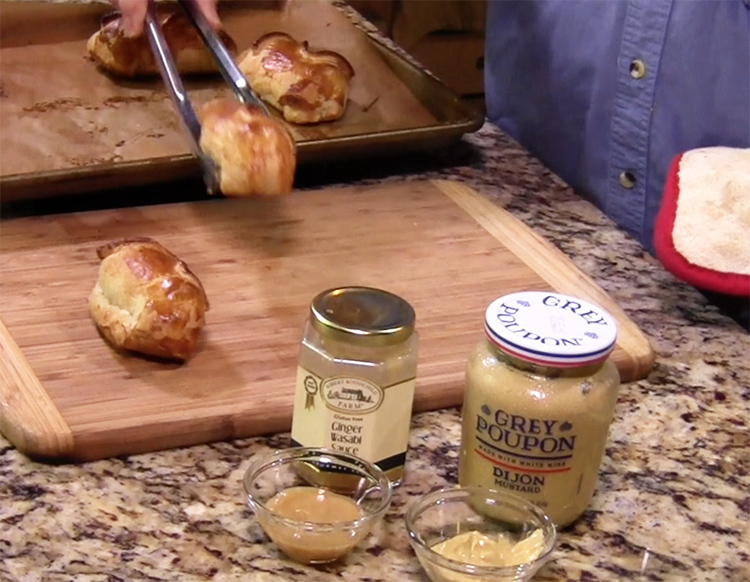 They can be served warm or at room temperature with assorted mustard.